The ruins of copper and tin mines can be found all along the west coast of Cornwall from its southern tip at Lands End north towards St Ives. We set off on a damp and extremely cold morning in June (it was supposed to be summer) to find some of those mine sites. This coast and the nearby inland moors are often shrouded by a mist that adds to the mystery of this once very busy mining area. The noise of mine heads and crushing hammers that boomed out across the whole area are now silent. The smoke and steam from the engine houses rise no more. Only ruins of the past remain to remind us that here men, women and children worked long hours in often very dangerous conditions to mine ore. And some of those miners were David’s forbears. We needed to learn more. Parking the car near the old Levant Mine, we were stunned by the beauty of the area and by the number of wild flowers that adorned this long disused mine site. Thrift was again in abundance. It’s probably the most common plant of the coast. Being common, it’s often overlooked. But each flower is a delight. Walking here is very picturesque with chimneys and the ruins of mine workings rising from the landscape. Any one who enjoys walking holidays would do well to consider this coast. There were carpets of yellow Vetch and Silene everywhere. in an attempt to shelter from the wild winds that often lash these shores. These tiny flowers are well worth the effort of getting down low to enjoy them. The plant name is unknown to us. Any help? But we hadn’t come just to enjoy the wildflowers and the scenery. We’d come to learn something about the mines. We began by visiting the National Trust owned Levant Mine where some buildings and a steam pump engine have been restored. A guide is available to explain the workings and the history of these mines. A large part of Cornwall is made up of slate and greenstone intruded by granite and over 150 other minerals have been found in this ancient geological area. Of most importance were the ‘veins’ of tin and copper ores found within fractures in the granite. For about 2,000 years, copper and tin mining has been part of Cornwall’s history. Much of the very early mining was ‘stream’ mining for ore found on or near the surface or in streams. Mining families were somewhat self sufficient as they also farmed the fields whose boundaries had been laid out hundreds of years before. 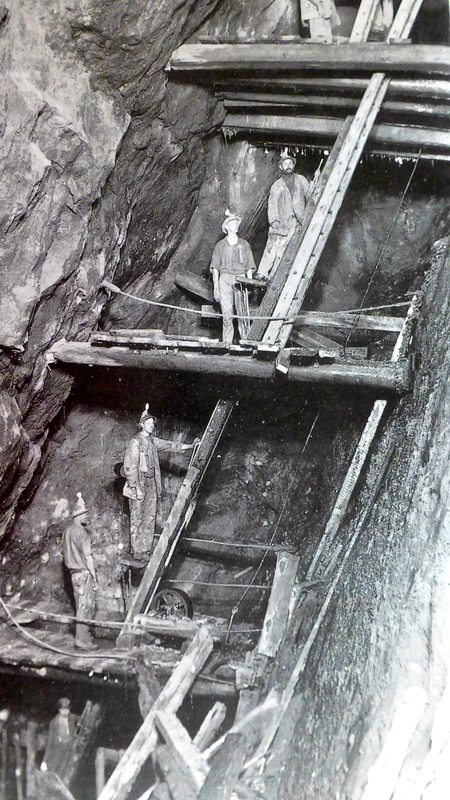 Gradually, the mines became ‘beam’ or ‘coffin’ openwork mines in which ore close to the surface was dug by hand. By the mid 16th century miners were working the alluvial deposits in the inland valleys and the ore loads that could be seen in the coastal cliffs. As miners began to dig down into the cliffs, it became ever more obvious that here was the real wealth. But to get to this ore would require underground mines – and that would require money that the poor miners did not have. All this coincided with a growing market for minerals as the industrial revolution changed manufacturing processes. For the established land owners and gentry, and for outside investors, there was wealth to be made in Cornwall. And so, in the the late 1700s and early 1800s, many new mines were opened in Cornwall. 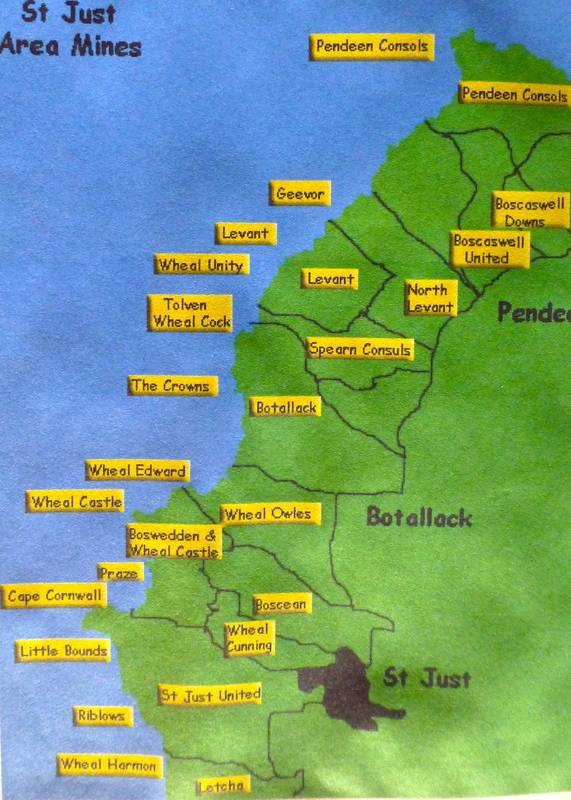 St Just, the only market town in this isolated coastal area, now became more important. It was soon realised that the richest veins were down very deep and some even extended out under the sea. With much more profitable ore loads on offer, the Levant Mining Company was formed in 1820 by twenty investors, or ‘adventurers’ as they were called in Cornwall. With a capital of ₤400 divided into 80 shares, these investors shared in the profits of what became a very successful mine. Many of them were not even Cornish men and had never been into a mine. They had no real idea of the hard work involved to provide them with their ever increasing wealth. There was a great divide between the investors and the miners. Underground mining was very dangerous in extremely difficult conditions. Miners, and their women and children who also worked for the mines, took home very little pay and lived relatively short lives whilst the ‘adventurers’ became ever richer. This is one of the cartoons from a little book that I bought at the mine, “A Family Guide to Mining in Cornwall” written by Lucia Crothall. It tells the stories of a real miner, John Harris, who began working underground at the age of ten. John became famous in Cornwall for the poems he later wrote about his experiences. While John and other boys like him worked with the miners underground, above them, in their fine houses, the owners wined and dined and lead the good life. This great divide between the rich and the poor was seen as ‘normal’; part of the mores of the time – each one born to their place in life. But that would change over the years as miners began to take on the idea of unionism, which of course was resented by the owners. It was, in fact, against the law to speak of unions and many a miner who spoke his mind was imprisoned or transported to Australia as a convict. It would take years of outspokenness by many brave men before conditions would change in favour of better conditions for the miners. As Levant Mine was developed, it was found that the richest lodes of ore were not only deep under the ground but they extended far out under the sea. As each lode was mined out, the shaft was dug down further to find the next rich vein of ore to be mined. Some of the working ‘levels’ that ran off from the shaft extended out over a mile under the sea. In time, the Levant shaft went down to 350 fathoms (2,100 feet or 640 meters) – Cornish mines were always measured in fathoms, one fathom equalling 6 feet. So not only did the miners have to climb down a long way, but then they had to ‘walk’ a long way through cramped, rough tunnels before they even began their ten to twelve hours shift. Above their heads they could hear the rumble of the sea as it churned the sea bed, particularly in stormy weather. Water posed the constant threat of flooding. But no matter the conditions, they had to work to feed their families. Despite the conditions, and maybe because of their ability to overcome hardship, over the years they became very proud of their skills as miners. John’s father used a spike and hammer to make a hole to take some blasting powder, an activity that often caused injury in mines. When the rocks were blasted away, John’s task was to put the loose pieces of ore into a wooden barrow (like the one above that was found on another mine site.) He then wheeled the barrow, in the dark, along the rough ground of the level to the shaft. There, he loaded the rocks into egg shaped buckets, called kibbles, to be hauled to the surface by a horse powered winch. One day the chain broke and a bucket filled with ore crashed down right beside John. Another day the roof above where he was working suddenly collapsed with a deafening noise filling the tunnel with dust. John was filled with the fear of being trapped. At the end of working hard for ten to twelve hours in those cold, damp, very dark conditions, John and his father had to climb back up all those wooden ladders to get back ‘to grass’. Many times it was recorded that an exhausted miner either lost his footing or his grip on the rungs and fell to his death down the mine shaft. Those climbing up beneath him were often taken down as well. Death walked beside each miner each day. But the mateship of miners and their loyalty to each other became legendary. ‘One for all’ was their motto and there were always men ready to help search for fellow miners trapped underground. But the death or maiming of a miner mattered little in the eyes of most owners. Miners were expendable. If they didn’t like the working conditions, they could go without work. There were plenty of others who needed work to try to feed their families. There was not a lot to a miner’s life except work, smoking his clay pipe, drinking ale to slake his thirst and begetting more children to become workers to help feed the family. While boys went below ground with the men, women and girls (the bal maidens) and small children worked above ground. There are also accounts of women, often stripped to the waist in the heat and dust, working below ground pulling the carts of ore back to the shafts. On the surface, the work of the bal maidens, small children and men too old, sick or maimed to work underground, was to sort and break up the ore with hammers before taking the broken rock to the noisy stamping crushers. It was hard, rough work for very little pay; a few pence at the most. 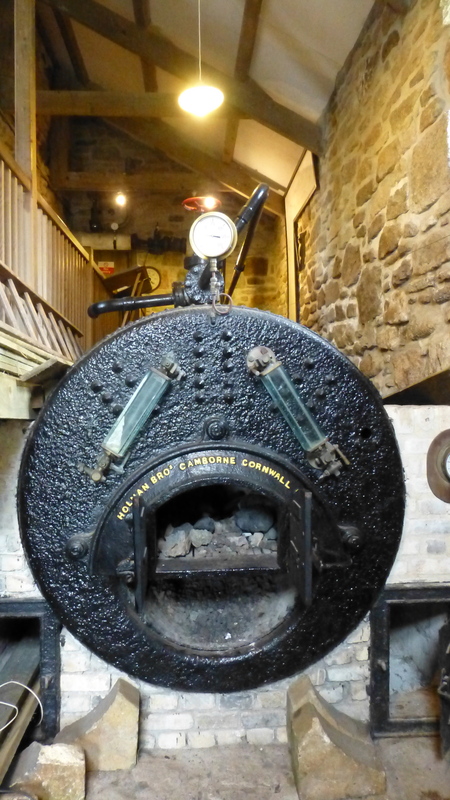 During the mid 1800s, Cornish engineers and innovators harnessed the power of steam to develop steam engines that helped to make the mines more efficient and improve safety standards. These engines were housed in buildings like the one that has been restored at Levant. There were, at one time, 2,500 of these engine houses in Cornwall. Most are now in ruins; reclaimed by nature. During our guided tour of Levant Mine, the beam engine was powered up for a short time to demonstrate how it had changed the way mines worked and how much deeper a mine could go if engines were used. These engines made it possible for ore to be lifted to the ground mechanically instead of by horse drawn winches. They also made it possible to pump out water much more efficiently. One of the benefits of the steam engines was that the ever inventive Cornish engineers, like Richard Trevithic, improved the ways that mines worked. One of these inventions was the ‘man lift’. Using the movement of the pumping shafts, miners were able to move up and down the shafts in small stages of about ten to twelve feet. This made descent into, and ascent from the workings, easier and safer. Because of that, they were able to work longer and harder at the ore face thus improving profits. It was a win-win situation. However, there were times when these lifts were not maintained properly and miners crashed to their deaths below when the man lift broke. It happened at Levant in 1919 with the deaths of 34 miners. Times became very hard for the miners and their families in the 1840s because food was scarce and costly in Cornwall; there was a potato famine and the Corn Laws sent the prices of wheat well out of the reach of poor miners. Times were becoming harder for the mine owners too. Copper and tin were found in places like Malaysia and South America and, in 1850, in Burra, South Australia. As prices fluctuated for the Cornish minerals, many mines became unviable. At the same time, both Cornish miners and Cornish engineers were highly sort after by these overseas mines; the Cornish knowledge of mining was well known. Many miners left Cornwall including David’s Great, Great, Great grandfather, William Ellis, who sailed with his wife and young children to start a new life in South Australia. When gold was discovered in Victoria, they moved there to mine for gold in Castlemaine. As word of gold finds in Australia and California became common knowledge in England, thousands more miners and their families sailed from Cornwall across the world in the hope of making better lives for themselves. And among those who sailed to Australia, were David’s Great, Great Grandfather, Thomas Bray and his brother James. Unknown to each other whilst living in Cornwall, these two Cornish mining families were joined together in Australia when William’s grandson married Thomas Bray’s daughter in Victoria in 1889. These families were never to return to Cornwall. Apart from the cost and the length of a return journey ‘back home’, there was no reason for a miner to return to Cornwall. By the end of the 1800s and early 1900s most of the mines were closing and Cornwall was left to reinvent itself. And that reinvention eventually came in the form tourism. Over time, as road and rail began to penetrate further into the scenic Cornish countryside, the lives of the Cornish miners, fishermen and smugglers became the stuff of legends and that gave the impetus for the growth of museums. Many hotels and guest houses were built to house these visitors. Cornish families opened their homes as B&Bs. And to sustain their way of life, wealthy families were forced to open their gardens and houses to the public. Many properties were given to the National Trust. We, like thousands of visitors every year, enjoyed this new Cornwall even while we were learning more about the lives of David’s ancestors, the Bray and Ellis families. After our visit to the mine, we had much to think about as we turned inland once again to explore the narrow flower filled roads of the moors. Staying away from the main tourist destinations, we were beginning to fall in love with Cornwall, its narrow roads, its small villages and its very friendly people …to say nothing of tasty Cornish pasties and afternoon teas of warm scones, home made strawberry jam and thick clotted cream. But more of that anon.